Ultimate Ears Blast review | What Hi-Fi? The Blast is all-action in terms of both sound and durability. 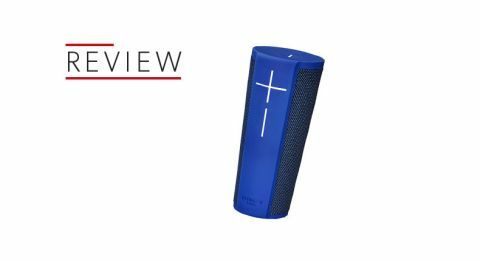 We liked Ultimate Ears’ first Alexa-powered portable speaker, the Megablast (£270), so much its five-star review made particualr mention of its “fun, energetic and admirably controlled performance”. So it’s with some sense of anticipation we review the Blast – a smaller, more affordable version of the Megablast. Available for £70 less than its sibling, the Blast retains all of its features (smart and more). Not only that, the Blast reads as a near-facsimile of the existing five-star UE Boom 2 speaker – it’s safe to say the new smart speaker is already off to a promising start. The tough, rugged exterior and funky design that we love about Ultimate Ears’ speakers is back. Chuck it in your rucksack, take it camping or to the beach – the portable, durable and waterproof Blast will survive all kinds of rough terrain, knocks, drops and downpours. Just like the Boom 2. However, there are subtle differences that mark the Blast as a more grown-up, on-trend smart speaker. The ends are flatter than the Boom 2’s, the six colourful finishes are less flashy than in the rest of UE's colour-chart, and a new white LED strip glows and blinks when you interact with Alexa. You can even get an optional charging stand (Power Up, £35) to prop the Blast up when it’s inside your home. You get 12 hours of battery life from the Blast (down from the Boom 2’s 15 hours) and, while Bluetooth and now wi-fi are available for streaming music (the latter through Alexa), the Blast no longer has a 3.5mm audio input. With flocks of manufacturers getting in on the new smart speaker craze by integrating Amazon’s Alexa voice assistant into their speakers (Sonos One being one of the most capable examples), Ultimate Ears has the distinction of being the first to offer the feature in a portable speaker. You’ll need to download the bespoke app (free for iOS and Android) to connect the Blast to your home network and get Alexa up and running. Set-up is painless and the app is neatly designed, although you’ll also want to download the dedicated Alexa app to properly customise settings, skills and routines. Like the Sonos One and Amazon Echo speakers, you simply say “Alexa, turn on the lights” or “Alexa, play Breezeblocks by alt-J” and the speaker will carry out your command. The Blast picks up our voice easily and Alexa is swift to respond. At the moment, Alexa can only play tunes through Amazon Music Unlimited and TuneIn radio. Support for other services, such as Deezer and Spotify, is coming soon, but you might find yourself using Bluetooth for the more popular music streaming sites. There’s also a free three-month trial of Amazon Music when you buy the Blast, which is worth checking out if you can’t wait to DJ your own party with the power of your own voice. Unlike the Megablast, which had its internals tuned for a louder, better sound, the Blast simply mirrors the Boom 2’s performance. While we can’t help but wish Ultimate Ears had given the Blast a boost, any serious misgivings are forgotten once we start listening. The Blast’s cylindrical 360-degree design means it throws sound evenly around the room. It’s a loud, clear and focused performance regardless of where the speaker is placed. It may not go as loud as the more substantial Megablast but, if you want to summon Alexa, you and your friends will end up shouting to be heard over the music. Play Seven Nation Army by The White Stripes and the Blast charges through the tune with stacks of energy and punch. As expected, the low end doesn’t dig quite as deep as the Megablast but it’s admirably, and precisely, controlled. Strings are pulled taut, drums hit with a sharp thwack, and there’s plenty of crunch and grind to the distorted guitars. For a speaker of its kind and size, the Blast punches hard. The timing is snappy, and there’s a great sense of dynamism and momentum that keeps us hooked. Voices are projected cleanly, cutting through noisier moments even when the music reaches a crescendo. The power vocals of En Vogue during Don’t Let Go are full of passion and reach soaring peaks with aplomb. It’s not all about being raucous, though. The Blast shows off its sensitive side with a spacious and nicely detailed presentation when playing the sparsely recorded Something I Can Never Have by Nine Inch Nails. There is a slight top end shine to the Blast’s sound. Crashing cymbals plus significant volume puts a spotlight on this, but it doesn’t affect the overall performance too much. A richer low end might even the balance out - and we’d certainly recommend running the speaker in for a couple of nights before proper listening. The Sonos One is the Blast’s nearest Alexa-powered smart speaker rival but, despite both costing around £200, they arguably cater for different audiences. The Sonos One is mains-powered and full of greater multi-room features for the home, while the battery-powered Blast is designed for being used outdoors in all sorts of terrain. The soft edges and smooth balance of the Sonos may be gentler on the ears, but the Blast’s fun dynamics are hard to ignore. Ultimate Ears has a knack for finding the right combination of sound, design and features in its portable Bluetooth speakers, and it does so again with the Blast. At its original price of £120 the Boom 2 won us over and, though the Blast is a tad pricey at £200 (especially since the bigger, even more capable Megablast is just £70 more), it’s still a fun, exciting speaker that’s sure to be a crowd-pleaser.